NEW WEBSITE AND BLOG ARE UP! After a few seasons of working in Chicago, I realized my site was in need of updating and my presence (here in Chicago) needed expanding. So, I reached out to local designer (and long-time friend) Will Hobbs to help me develop some new material. 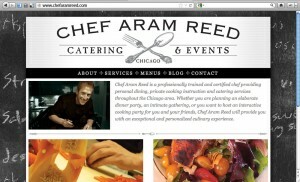 My new site, chefaramreed.com, rolled-out in early August, and this blog will continue to update with news and other noteworthy entries to keep you up-to-date. Keep an eye out for upcoming events and classes, too… there should be some really interesting developments over the next couple of months!